Just a word or two about my .308 Savage 112BT and the excellent work preformed by Kevin Rayhill at Stockade Stocks Inc. New, out of the box, this rifle shot in the mid two's to upper fours consistently. Had it re-barreled after 5200 rounds by Savage Arms and the gun never shot the same after the re-barrel job. Several smith's (including SSS) re-barreled this gun and tried to bring this rifle back to it's original performance but to no avail. After 11,000+ rounds I sent the gun to Kevin for an 8 twist 6mm BR barrel, his Long Range 1000 BR stock installed and I had the rifle accurized....BINGO!!! Now I am back to shooting in the 2's and 3's again with the heavy 6mm bullets. The bedding job on this rifle is outstanding and the LR 1000 BR stock is exceptionally stiff. 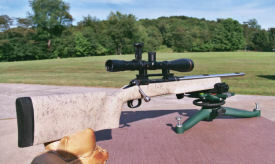 With this weighted stock, the gun weighs in at 171/2 lbs. Good job Kevin!!!! Thanks again for putting the gun together for me. It is as much or more than I had hoped for and performed beautifully on this animal. 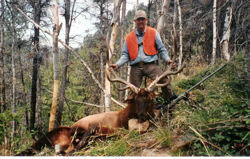 He scores 340 gross and was killed at 604 yards. 30 Cal Rayhill Rocket.